The pace of activity in China's vast manufacturing sector quickened for the first time in 13 months in November, a survey of private factory managers found, adding to evidence that the economy is reviving after seven quarters of slowing growth. The final reading for the HSBC Purchasing Managers' Survey (PMI) rose to 50.5 in November from 49.5 in October, in line with a preliminary survey published late last month. It was the first time since October 2011 that the survey crossed above 50 points, the line that demarcates accelerating from slowing growth. The final HSBC reading follows a similar survey by the National Bureau of Statistics (NBS) released this weekend, which showed the pace of growth in the manufacturing sector quickening. The official PMI rose to a seven-month high of 50.6 for November, from 50.2 in October. 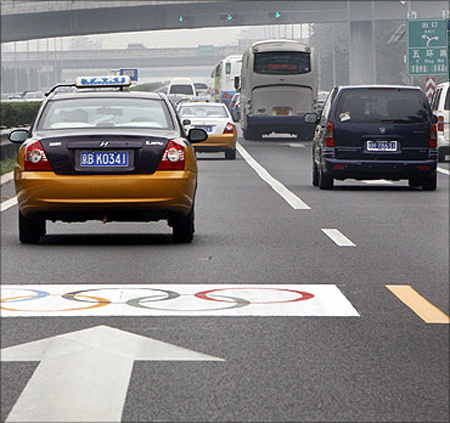 "This confirms that the Chinese economy continues to recover gradually," HSBC's chief China economist Hongbin Qu wrote. 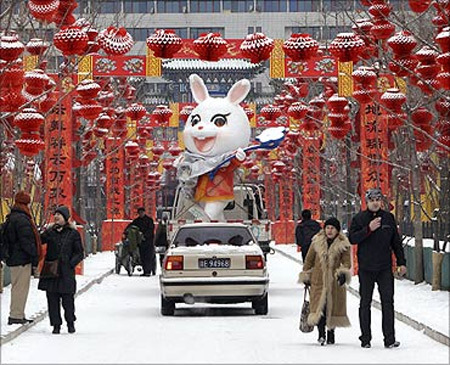 Image: A rabbit sculpture is carried away from the Ditan temple fair after a snowfall in Beijing. An official PMI survey of China's non-manufacturing sectors also ticked up, to 55.6 in November from 55.5 in October, led by expanded activity in construction services. But growth in air and rail transport and food and beverages both slowed. While a recovery in growth appears possible, there are troubling signs that China is still relying too much on state-led investment rather than the more dynamic private sector. Growth accelerated for large firms for the third month in a row, but medium and smaller companies saw a retrenchment, with the decline more pronounced for the smaller firms, the NBS said in a not accompanying its official manufacturing PMI survey. 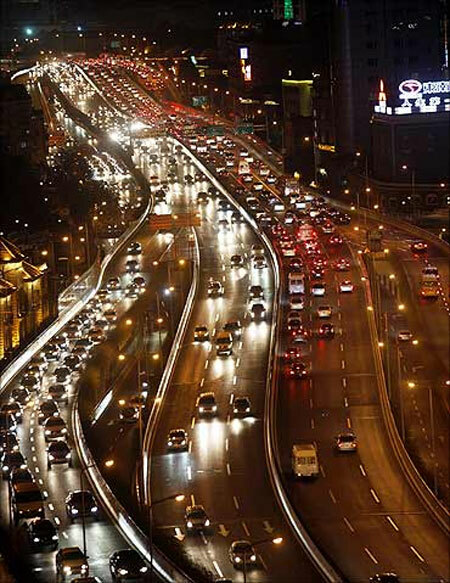 Image: Traffic flows on a flyover at the Bund in Shanghai. "The improving numbers are mostly because of government investment," said Dong Xian'an, economist with Peking First Advisory, referring to the official PMI. "From the second quarter the government has unleashed a lot of projects, and that has started to be felt in the economy, but it's not a very healthy recovery yet." In another sign that demand remains lacklustre, an HSBC sub-index for output prices fell despite a rise in a different sub-index for input prices, indicating that firms are unable to pass rising costs on to buyers. 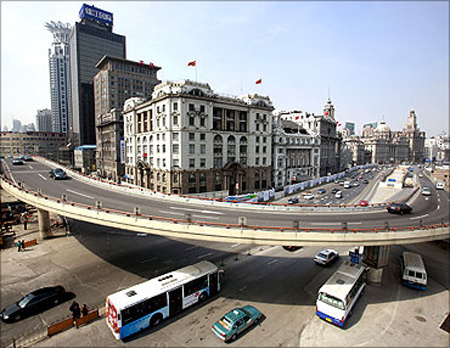 "Whilst we feel that the economy has been stabilized through the short-term, we feel that the manner in which activity has been revived will retard China's economic reform agenda and make the transition onto a sustainable footing all the more tricky," wrote Xianfang Ren and Alistair Thornton of IHS Global Insight. 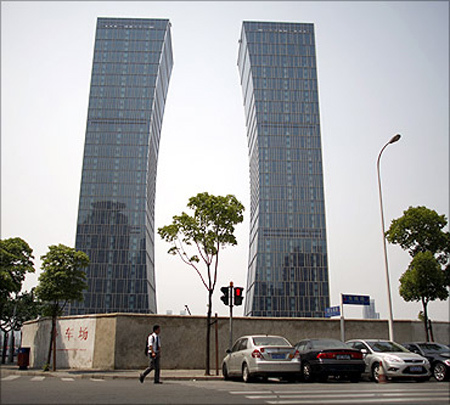 Image: A man walks in Lujiazui, a financial district in Pudong, Shanghai. Smaller and private firms are still pleading for greater access to credit and investment incentives, which have gone disproportionately to the state sector, particularly since the financial crisis of 2008-2009. Government intervention to mask debt problems where they do appear runs the risk of a socialisation of losses, the IHS Global Insight analysts warned. "Production can continue (hence contributing to GDP), and employment can remain tight. Our fear, therefore, is that whilst activity is resuming, economic efficiency is declining. This has negative longer-term consequences." Overall, China's economic health has improved since September, with an array of indicators from factory output to retail sales and investment showing Beijing's pro-growth policies are starting to gain traction. Output, new orders and new export orders all improved, the official PMI showed, but a sub-index tracking employment deteriorated. Private firms generally account for more new jobs than does the state sector. China's annual economic growth dipped to 7.4 percent in the third quarter, slowing for seven quarters in a row and leaving the economy on course for its weakest showing since 1999. Given the recent signs of recovery, many analysts expect the economy to snap out of its longest downward cycle since the global financial crisis, and start to trend upwards in the fourth quarter. The end of a destocking cycle and a greater pace of investment are expected to keep driving up domestic demand. Economists also warn of downside risks from still cloudy external markets. The European debt crisis and listless U.S. economy continue to crimp demand from China's two largest trade partners. China's central bank has moved cautiously in easing monetary policy to underpin economic growth, wary of reigniting inflation and fanning property prices which are still high. It cut interest rates twice in June and July and lowered banks' reserve requirement ratio by 150 basis points in three stages since last November, but has refrained from further cuts since July. 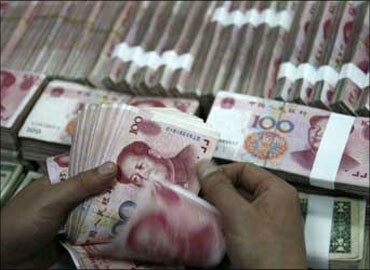 The authorities have opted to inject liquidity via open market operations to pump short-term cash into money markets. The official PMI generally paints a rosier picture of the factory sector than the HSBC PMI because the official survey focuses on big, state-owned firms, while the HSBC PMI targets smaller, private companies. There are also differing approaches to seasonal adjustment between the two surveys.